Why work at Mayhew? Take a look at our employee benefits and career opportunities in London. All Mayhew team members receive a basic annual leave entitlement of 33 days (including statutory bank holidays). This increases to 34 days after two years’ service and 35 days after five years. In addition to this, Mayhew gives staff an extra day off on their birthday! On completion of two years’ service, staff have the option to buy or sell up to five days annual leave each year in January. This is worked out pro rata for part time staff. Permanent members of staff, on completion of 2 years’ service, have the opportunity to have an extra five days paid annual leave a year if they are volunteering on a Mayhew supported project. They must complete a report and presentation to the rest of the team and must not have already bought extra annual leave. 10 days sick pay will be paid to staff in a rolling year. This is paid pro rata for part time staff members. Childcare Vouchers are an employee benefit that Mayhew offers that is tax and National Insurance exempt (up to specified limits), generating savings for parents. The Government requires all employers to auto-enrol their eligible employees to a Pension Scheme. Mayhew’s Pension provider is ‘The Peoples Pension’. All eligible staff will be auto-enrolled onto the scheme and will contribute a percentage of their earnings towards their pension. Mayhew will also make a monthly contribution. Upon completion of their probation period all staff are invited to join our Health Cash Plan scheme (currently administered by Simplyhealth). The scheme covers/makes a contribution towards a range of benefits including visits to the dentist, optician, physiotherapist, chiropractors etc. Claims can be made up to annual limits for each category of cover. Staff who opt to join our Health Cash Plan are automatically covered under our EAP, this provides access to a 24/7 telephone counselling service and in some circumstances six free face to face counselling sessions. Mayhew will pay for eye tests for staff that regularly use Display Screen Equipment (DSE) and will also contribute up to £65 for employees who require glasses specifically for DSE usage. 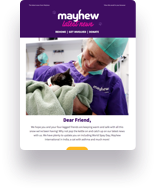 All Mayhew staff can bring their pets in for low cost veterinary treatment at Mayhew. Charges will be 50% of our standard Mayhew price for all drugs and procedures. In addition, you will not be charged for consultations. Animal food ordered through Mayhew is available at cost price. This scheme is open to all staff (post probation) who wish to buy a bike to use for commuting to and from work, for part of or their entire journey. This is a government sponsored scheme and payments for the bike are taken from the employee’s salary before tax and National Insurance deductions over a 12 month period. On completion of their probation period an interest free season ticket loan is available to all staff, deductions will be made from the employee’s monthly pay. Uniforms are provided for all staff working within animal care and welfare and the veterinary clinic. From time to time there may be additional benefits offered to staff. These will be communicated as appropriate.